Hunter, K. et al (2013) Inherited variation in miR-290 expression suppresses breast cancer progression by targeting the metastasis susceptibility gene Arid4b. Cancer Research, doi: 10.1158/0008-5472.CAN-12-3513. [pEZX-MR06 plasmids]. Wei, R. et al (2013) Dynamic expression of microRNAs during the differentiation of human embryonic stem cells into insulin-producing cells. Gene,Volume 518, Issue 2, 15 April 2013, Pages 246–255. [miR-223 primer]. Gao, F. et al (2013) miR-9 modulates the expression of interferon-regulated genes and MHC class I molecules in human nasopharyngeal carcinoma cells. Biochemical and Biophysical Research Communications, Volume 431, Issue 3, 15 February 2013, Pages 610–616. [Lentiviral expression clones for miR-9 (pEZX-MR03; catalog# HmiR0017-MR03)]. Yu, S.J. et al (2013) MicroRNA-200a Promotes Anoikis Resistance and Metastasis by Targeting YAP1 in Human Breast Cancer. Clinical Cancer Research, 19.6 (2013): 1389-1399. [pMR-miR-200a]. Bhutia, Y. et al (2013) Differential Processing of let-7a Precursors Influences RRM2 Expression and Chemosensitivity in Pancreatic Cancer: Role of LIN-28 and SET Oncoprotein. PloS one, 8(1): e53436. doi:10.1371/journal.pone.0053436. [FIV-let-7 constructs (let-7a-2, let-7a-3, let-7b, let-7c, let-7e, let-7f-1, let-7f-2, let-7g)]. Ebrahimibarough, S. et al. (2013) Programming of human endometrial-derived stromal cells (EnSCs) into pre-oligodendrocyte cells by overexpression of miR-219. Neuroscience Letters, Volume 537, 14 March 2013, Pages 65–70 [MiR-219-GFP]. Swaminathan, G. et al. (2012) A Role for microRNA-155 Modulation in the Anti-HIV-1 Effects of Toll-Like Receptor 3 Stimulation in Macrophages. PLoS Pathog 8(9): e1002937. doi:10.1371/journal.ppat.1002937. 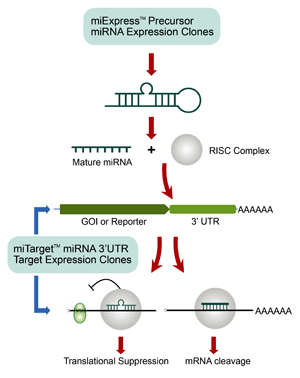 [hsa-miR-155 precursor (HmiR0358)]. Li, L et al. (2012) One SNP in the 3′-UTR of HMGB1 gene affects the binding of target bta-miR-223 and is involved in mastitis in dairy cattle. Immunogenetics, Volume 64, Issue 11, pp 817-824. [bta-miR- 223 precursor, pEZX-MR04]. Li, L. et al. (2012) One SNP in the 3′-UTR of HMGB1 gene affects the binding of target bta-miR-223 and is involved in mastitis in dairy cattle. Immunogenetics 2012, DOI: 10.1007/s00251-012-0641-1. [pEZX-MR04 non-viral vector]. This entry was posted in miRNA完整解决方案, 产品, 克隆库 and tagged miRNA前体表达克隆. Bookmark the permalink.